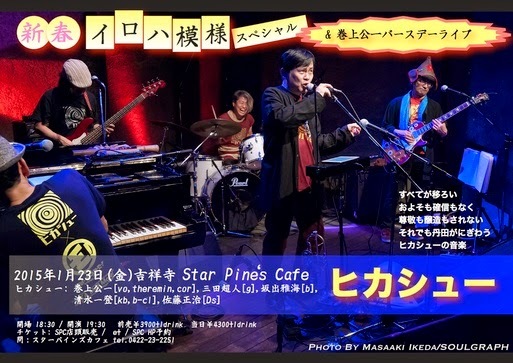 This month Hikashu will perform two gigs in Tokyo. One is Shubuya with other musicians, and the other is solely their own, in Kichijoji. The Shubuya gig is an interesting one - there are other two acts who has been active for years. Endo Kenji, nicknamed En-Ken, is a singer-songwriter who's been around for quite some time, even longer than Hikashu. He debuted in late 1960s as a mellow folk singer, but later reinvented himself as a power rocker. At this gig he will appear as a solo act - just himself and an acoustic guitar - but last time he performed, as a solo, along with Hikashu, he said "trying to be louder than Motorhead" on stage. Well, he performed fiercely and everybody were impressed. Also Yamada Koji, the other act, has a long career and his own style, which is very interesting. 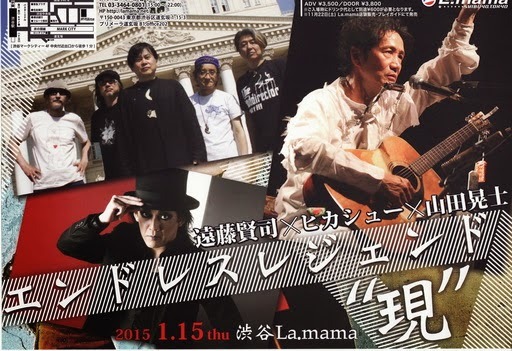 The Kichijoji gig is billed as commemorating Makigami's birthday, actually it's a few days later, but anyway it's going to be interesting because they are likely to play selections from the forthcoming album, like last time.